In April 2000, I observed “In recent months, we have made the rather bizarre assertion that the Nasdaq is likely to lose somewhere between 65% to 83% of its value from its recent highs to its ultimate bottom.” Though valuations had been rich for some time, that overvaluation suddenly mattered once deteriorating market internals signaled a shift toward increased risk-aversion among investors. In early October 2000, I wrote “On Friday September 1st, the S&P 500 rallied to a peak of 1520.77, capping a string of strong advances. Yet due to a deterioration of market action ... trend uniformity had shifted to an unfavorable condition, and we moved to defend our portfolios more fully against downside risk.” The Nasdaq Composite went on to lose 78% of its value from its March 10, 2000 high of 5048.62 to its October 9, 2002 low of 1114.11. The S&P 500 Index lost 49% from its March 24, 2000 high of 1527.46 to its October 9, 2002 low of 776.76. In 2006, still more than a year before the 2007 peak in the S&P 500, I wrote, “the stock market has historically had a strong tendency to deliver above-average returns from favorable levels of valuation, and to deliver unsatisfactory returns when valuations have been elevated (as they are today). In my view, the stock market remains richly valued, and investors should not rule out an S&P 500 trading in the 700-800 range in the years ahead as a reasonable (not catastrophic) probability. Investors should not be misled to believe that broad exposure to stock market risk represents sound investment here, or that a shallow decline of a few percent has suddenly made the stock market a bargain.” In 2007, I emphasized the growing downside risks in a weekly comment titled Fair Value, 40% Off. Though valuations had been rich for quite a while, our measures of market internals finally shifted to a clearly negative condition in July 2007. Within weeks, the S&P 500 set its bull market high on October 9, 2007 at 1565.15 and followed by losing nearly 57% of its value by the March 9, 2009 low of 676.53, putting the total return of the S&P 500 behind the return on risk-free Treasury bills all the way back to June 1995. The lesson we’ve drawn from recent years is not that historically reliable valuation measures are no longer useful. It’s not that overvalued, overbought, overbullish conditions can persist indefinitely without awful consequences. It’s not that “this time is different” in some way that cannot be accounted for with historically-informed methods. The primary difference between the half-cycle since 2009 and prior market cycles across history is that overvalued, overbought, overbullish conditions have been extended to further extremes, without a material correction, for a much longer period than usual as a result of yield-seeking speculation. The central lesson we’ve drawn is about the criteria that distinguish when the consequences of overvalued, overbought, overbullish extremes may be deferred, and when those consequences are likely to emerge with a vengeance. Last week’s comment – Ingredients of a Market Crash – addresses some of these considerations, and offers an indication of historical market outcomes during periods that are identified as hostile under the same set of market conditions we identify at present. There’s no assurance that the outcomes in the current instance will be similar. But recognize that no component of our approach – not valuations, not market internals, not trend uniformity – is constructive here. We now observe conditions under which the belief that “this time is different” has historically been most likely to implode. There’s really no point in trying to convert anyone to our viewpoint. Somebody will have to hold stocks over the completion of the present cycle, and encouraging one investor to reduce risk simply means that someone else will have to bear it instead. But for those who understand the narrative of the recent half-cycle, where our challenges have been, and how we’ve addressed them, I do encourage reviewing all risk exposures from the standpoint of the losses that have repeatedly occurred over the completion of market cycles that have reached valuations anywhere near current levels (1929, 1972, 1987, 2000, and 2007). The point is not to discourage stock holdings entirely, but rather to ensure that exposure is not so large that a steep market loss would be intolerable. It’s important to recognize that the market is not only at a point where unusually rich valuations are already in place, but also where market internals and our measures of trend uniformity have clearly deteriorated. This is the most hostile set of market conditions we identify, and it closely overlaps periods in which the stock market has been vulnerable to abrupt air-pockets, free-falls, and crashes. From a valuation standpoint, this assertion is based on the same methods that brought me to warn of those risks in 2000 and 2007. It is based on the same methods that encouraged me to be a leveraged bull in the early 1990’s, allowed us to shift to a constructive stance after the 2000-2002 bear market, and identified market undervaluation in late-2008 (see Okham’s Razor and the Market Cycle for more on these valuation estimates). All of this has certainly been obscured as a result of my unfortunately-timed 2009 decision to stress-test our methods against Depression-era data, and the later need to incorporate various overlays to the resulting ensemble methods in order to narrow their defensiveness during overvalued, overbought, overbullish periods. We’ve adapted quite a bit as a result, but don’t imagine that valuations or present market conditions can be dismissed because we encountered those challenges. Emphatically, we do not rely on a severe decline as a precondition to encourage a constructive position. As I’ve frequently noted, the most favorable market return/risk profile we identify emerges where a material retreat in valuations is coupled with an early improvement in our measures of market action. We will shift our stance toward market risk when our measures of valuation and market action shift materially, even if (as was the case in early 2003) valuations remain well above historical norms when that occurs. In my view, the problem for investors here is that they are placing elevated multiples on cyclically elevated profits without recognizing that the S&P 500, for example, is a claim not on some multiple of next year’s earnings, but on a long-stream of deliverable future cash flows with an effective duration of about 50 years. Moreover, our measures of market action and trend uniformity have shifted negative, removing our best measure of the speculative support that has underpinned the market and helped overvalued, overbought, overbullish conditions to be persistently extended in recent years. Understand that distinction, because as in 2000 and 2007, such shifts can make seemingly meaningless overvaluation matter suddenly and with a vengeance. Remember also that while interest rates do affect valuations, that effect is measurable, and it’s essential to do the arithmetic. If one expects 3-4 more years of zero short-term interest rates rather than a more normal level of say, 4%, it follows that one can justify stock prices that are 12-16% (3-4 x 4%) above historically normal valuations. Unless one expects zero interest rates or sustained profit margins at record highs for the next quarter century, it’s difficult to justify stock prices on the basis of low interest rates or cyclically elevated profit margins. I should emphasize again that our outlook will change as market conditions change. A material retreat in valuations, coupled with an early improvement in market action, will encourage a much more constructive or even aggressive investment stance even if valuations remain elevated relative to historical norms. At present, however, market conditions couple valuations that are more than double pre-bubble norms (on historically reliable measures) with clear deterioration in market internals and our measures of trend uniformity. None of these factors provide support for the market here. In my view, speculators are dancing without a floor. The back-story, however, is that Babson’s presentation began as follows: “I’m about to repeat what I said at this time last year, and the year before...” The fact is that Babson had been “proven wrong” by an advance that had taken stocks relentlessly higher during the preceding years. Over the next 10 weeks, all of those market gains would be erased. From the low of the 1929 plunge, the stock market would then lose an additional 75% of its value by its eventual bottom in 1932 because of add-on policy errors that resulted in the Great Depression. As a side note, those policy errors were not that banks were allowed to fail, but that policy makers allowed them to fail in a disorganized way, forcing loans to be called in rather than taking banks into receivership and restructuring existing debt. It's a distinction our own policy makers still haven't learned, and simply obscured and papered over in the 2008-2009 crisis through distortionary monetary policy, bailouts, and FASB accounting changes. As a consequence, the debt overhang is still very much intact, as the Center for Economic Policy Research recently warned in its 16th annual Geneva Report. But that's now a problem for another day. 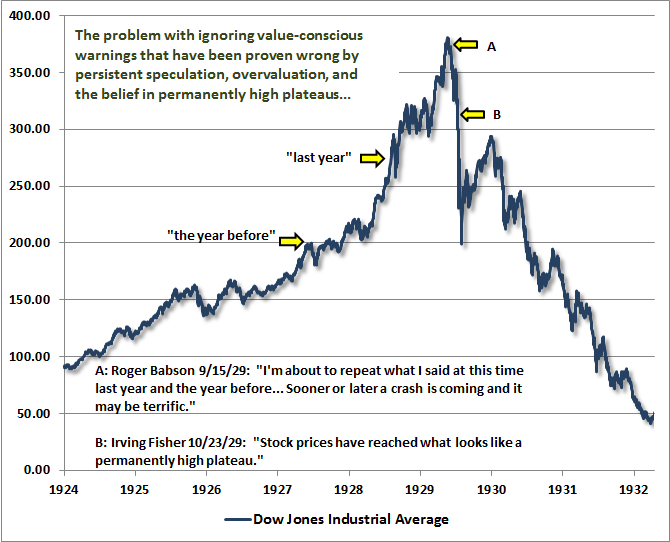 In any event, be careful in believing that a market advance “proves” concerns about valuations wrong. What further advances actually do is simply extend the scope of the potential losses that are likely to follow. That lesson has been repeated across history. The chart below offers a visual of this story, and may serve as a useful reminder that valuation concerns are generally not durably proven wrong by further advances, particularly when market valuation concerns have been ignored for a long while. The Hussman Funds remain defensive toward stocks, and modestly constructive toward Treasury bonds and precious metals shares. With market conditions in the same hostile configuration as we observed last week, the same considerations about day-to-day fluctuations apply. In Strategic Growth Fund, the recent decline has brought the major indices close to or below the strike prices of the long index put option side of our hedges. Though those put options currently represent just over 2% of portfolio value (and could lose that amount if the market was to advance between now and their late-year expirations if we were to hold them throughout such an advance), they are also likely to change significantly in value if the market declines significantly. In that event, we would expect good amount of “give-and-take” depending on whether the market advances or declines on a given day. So in the event of a significant market loss from here, these positions will tend to account a significant portion of day-to-day changes in net asset value.